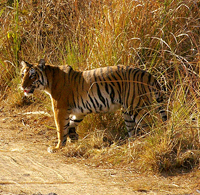 Early morning drive to Corbett from delhi, on arrival check in at wildlife resort, after having lunch at resort we will take you for a Jeep safari trip into the national park to explore the dense sal jungles of Corbett tiger reserve. This trip will move on under the guidance of an expert naturalist and guide. 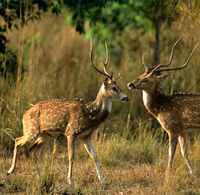 There is a great opportunity for viewing wildlife especially tiger and sloth bear, black bear, deer, leopard, wild cat etc. pass over the river Ramganga at Gathia Rao bridge for the Kanda Range the spot where Jim Corbett shot the Kanda man-eater. Arrive at the main region of Dhikala/Gairal , take lunch and relax in the calm beauty and capture the panoramic nature on your camera. You have a chance to visit one of the most well stocked wildlife library. Have dinner and night stay at resort. 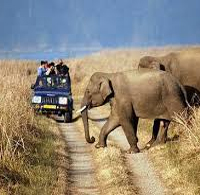 Early in the jeep safari into the national park, after brea`kfast we will take you to Dhikala/Gairal Forest Lodge by a car or gypsy. Take your lunch and rest, in the afternoon we will take you for a jeep safari to the grassland to view the wildlife especially the evasive tiger. For your safely the lodge is enclosed by the effective solar fence. You may sit on the varandah at night and enjoy the breathtaking wild and jungle's sound to get an unforgettable experienced. Overnight stay at Dhikala/Gairal Forest Lodge.